معرض سكة الفني هو أول مبادرة من نوعها تم إنشاؤها لدعم وعرض أعمال الفنانين الإماراتيين ودول مجلس التعاون الخليجي في مدينة دبي القديمة. هذا المعرض الفني هو مبادرة من هيئة دبي للثقافة والفنون، الهيئة المعنية بشؤون الثقافة والفنون والتراث في الإمارة، كما أنها واحدة من أبرز الأحداث في موسم دبي الفني. 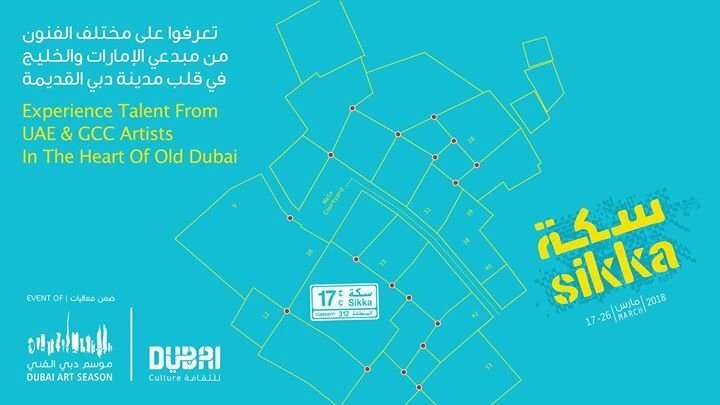 SIKKA Art Fair is the first annual initiative of its kind created to support and showcase Emirati, UAE and GCC artists in the heart of Old Dubai. The popular annual art fair is an initiative by Dubai Culture & Arts Authority, the Emirate’s dedicated authority for culture, arts and heritage, and is also one of the flagship events of Dubai Art Season. SIKKA’s 10-day programme features live music, interactive installations, free adults and children's workshops, an open -air cinema, on-stage performances, home-grown food vendors, panel discussions and so much more! Keep updated with the latest #SIKKA18 news here and by following @Dubai Culture and @dubaiartseason on instagram.